We have teamed up with Powers of One to bring you a diverse class package at two studios! Enjoy this special and receive 5 classes at Powers of One and 5 classes at Mindful Movements*. Give the gift of wellness this season by purchasing a gift certificate here. 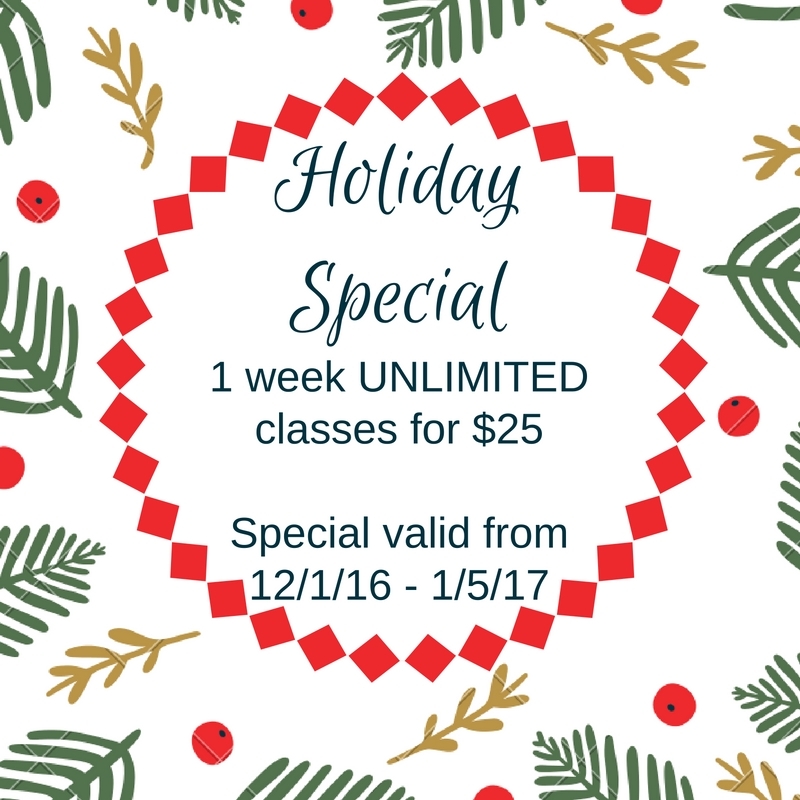 During this season of giving, we are giving you a Holiday Special of 1 week unlimited classes for $25. This special is great for loved ones visiting or students that are home for the holidays. This offer will only be valid from December 1st, 2016 – January 5th, 2017 so hurry and purchase yours now by clicking here! Erase pain and tension in your hands, feet, neck, and low back brought on by everyday stress, overuse, and age. This simple self-treatment can make your whole body feel better and provide relief from neck and low back pain, arthritis, bunions, plantar fasciitis, and carpal tunnel syndrome. Join MELT Instructors REBECCA BELL and VALERIE POWERS for an introduction to the MELT Hand & Foot Treatment. Learn how the connective tissue in your hands and feet gets dehydrated, the common aches and pains it can cause, and how to rehydrate this essential system in our bodies for vibrant health and pain-free movement. This workshop will be held on Friday, June 10 from 12:00 – 1:30 at the Powers of One Yoga Studio located on Main Street in Roanoke, IN. Welcome to our new website! We are excited to launch this new site which will give you better access to all the exciting programs we have available in our studio. We proudly offer quality programs such as Pilates, BarreAmped®, TRX®, and SpinPOWER. Our programs are taught by the most experienced staff in Fort Wayne. Feel free to browse our site, check out the videos of our programs and create your own account to get started in our program. We would like to thank Ferguson Advertising for the design of our site and Steve Vorderman for the photography. Please contact us for information at 260-710-7709. We are excited to present our Roll and Release Workshop on November 14th at the Powers Of One Yoga Studio in Roanoke, Indiana. At this workshop participants will learn how to systematically relieve pain, release tight and connective tissue, nourish tender areas of overuse, prevent injury and free yourself from trigger points. This event will take place November 14, 2015 from 11:00-1:00 at Powers of One Yoga. The week of September 7-12 Mindful Movements will offer complimentary classes. This is an opportunity to experience our intimate setting and how effective a small group class can be when you have hands on instruction. Form focused exercise is of utmost importance to us and we strive to keep all our classes small so every person can exercise safely and within their own fitness limits. We offer specialty classes in BarreAmped, TRX, and SpinPOWER. All of our instructors have more than 20 years experience in teaching and will look forward to making you feel comfortable in our classes. After visiting our studio for the first time you will receive a 10% discount on your first class package when purchase on the same day. Registering for our classes is easy by using our online registration. CLICK HERE to register for a class and select WELCOME WEEK FREE CLASS when choosing your pricing option. With such a large influx of new clientele, we have had requests for some of our previously offered roller workshops. So in August, we will be offering a few ROLL & RELEASE workshops. The first workshop will be an introduction to the PROPER use of the roller and will cover some general uses for the entire body. In the second workshop, we will focus on the LOWER BODY, zeroing in on problem areas such as the deep hip and glute musculature, tight hamstrings and quadriceps, release in the IT band, and issues with the shins and calves. PLEASE NOTE: If you have NOT attended a Roll & Release workshop with us before, you MUST attend the first workshop beginning at 10:45am before attending any other roller workshops. We do not suggest taking both workshops in one day, as it can have adverse effects on the connective tissues. We will offer more workshops later this year. Top-notch instructors, invigorating music and visualization come together to make Spinning class both fun and effective. Regardless of how fit, flexible or coordinated you are, you’ll get a great workout. Simply hop on your bike, set the resistance to the level that’s right for you, and let your instructor guide you through an incredible ride. Spinning® classes built around effective, individualized program design and post-ride data analysis. SilentSafari® wireless headsets with volume control allowing mental focus and an optimal workout. BRAND NEW Spinner® Blade ION™ bikes with one-of-a-kind true and precise measurement of ‘real effort’ plus a constant display of biometric feedback during every ride. The new Spinner® Blade ION™ bikes are the only ones in the midwest! We are also offering a Gentle Ride, will be for those looking to learn the basics of Spin while working at a moderate pace. Your instructor will guide, motivate, and push you to receive a great cardio workout. 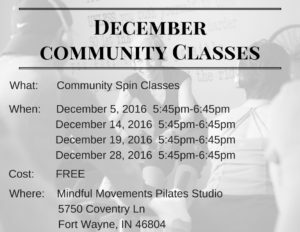 All levels are welcome to the Gentle Spin as you can control your own intensity.